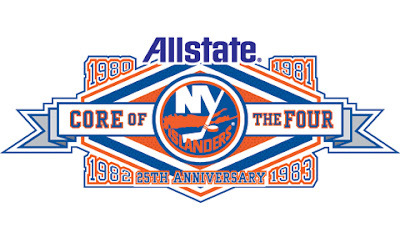 Islanders website: Had a release for the core of four weekend celebration coming up March 2nd to salute the players who were a part of all four championships which March 1st to salute the Islander fans. Trainer Ron Waske and equipment manager Jim Pickard, who were with the team for all four Stanley Cups, will also be honored as part of the event. Hall of Fame broadcaster Jiggs McDonald will serve as the Master of Cereonies. A special ceremony for the Core of the Four members will begin at 3 pm on the Coliseum ice. All fans in attendance will receive an Allstate commemorative Core of the Four banner. Throughout the game, the Stanley Cup will be on display at the concourse for photo ops. I love that logo and the colors. Going to be almost impossible to top the classy ceremony from Al Arbour night, but no doubt the Islanders will do a great job as always. We should see that 740 banner raised too.